Roman blinds are very popular thanks to its lightness and airiness. With their use in your interior you don't just get a shading system, but luxury design element that becomes the center of attention. Fabrics for this product are from the best European manufacturers of textiles. All the materials we offer meets the strictest rules of technology for color fastness, strength, sewing, modern trends and design. 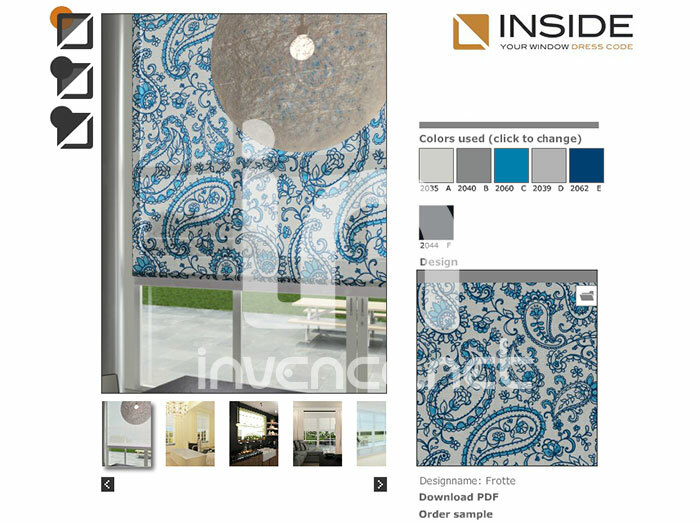 Thanks to the possibility of choice the colors, patterns and a wide range of lighting properties of the substances, the roman blinds will adorn any interior. Roman blinds are tailor-made according to your specifications or to the measurement of our technician. The price of plise depends on the dimensions (width, height), selected materials and the type of operation (chain, handle, motor). Roman blinds consist of a supporting metal profile to which is the front side in the entire area attached using velcro own fabric blinds. Visually it is a very clean system, besides the control chain (string, the motor variant not) nothing disturbs the view on the fabric. When pulling up the roman blinds fold into about 20 centimeter strips, when pulled, it will remain above the window decorative strip of fabric across width of the entire roman blinds. It is neccessary to have at least 20 cm of free space above the open sash windows or doors. Other design that solves the potential problem of a lack of space above the window, is a Roman blinds mounted directly to the window wing. Then it is not limited to manipulation of the window when opening it. This type of blinds is called VarioShade. Roman blinds can be used in atypical windows, oblique or even curved. You can choose from more than 400 kinds of substances of different qualities of light, color and pattern. If you didn't choose from our swatch, we highly recommend you to look at the configurator Inside Revolution substances that will fully manifest your creativity. Here you can choose from different colors and designs, and combine these into a single fabric. This designed unique substance is made just for you and from then sewn blind. Delivery time in this case is around five weeks.